These days, the way such a performer stretches is via a low-budget indie character study type thing, usually centered on some sort of dysfunctional family dynamic. For Kroll, this vehicle is “Adult Beginners,” a film for which the comedian himself concocted the scenario. Kroll plays Jake, a tech entrepreneur we first see living the high life of geek gurudom via venture capital: spouting blustery jargon, hoovering rails, inveigling the amorous affections of a not-entirely-bright young thing in ornate antique bathtub of a moneyed friend’s apartment. Before Jake can seal that particular deal, the project that was going to make him a rich man flops before it’s even manufactured, leaving him penniless, homeless, and with a lot of pissed off affluent ex-friends. What can Jake do but return to the bosom of his family, or what’s left of it: his ancestral home on Long Island, now occupied by his sister Justine (Rose Byrne), her husband Danny (Bobby Cannavale), and their winsome adorable toddler Teddy (played by twin winsome adorable toddlers Caleb and Matthew Paddock). Justine’s got another baby on the way, and is cool with letting Jake crash, as long as he helps out around the house. Jake protests that he’s no good with kids—arrogant, egocentric, endlessly snarky, he doesn’t seem to be much good with anything, frankly—but a deal’s a deal. And so he begins looking after the fella. You see where this is going, right? Well, kinda. What they call the “character arc” here is something that’s reasonably familiar: irritating shallow dude or dudette is softened up by adorable wide-eyed creature, takes some steps toward redemption, then has semi-catastrophic relapse into irritating shallowness again, makes an even bigger mess than he or she was getting out of in the first place, and then has to work that much harder to prove that after all he or she really DID get the Life Lesson that was staring them in the face the whole time. Yes, that is pretty much what happens here, but fortunately, it’s not quite as tritely done as it may have been. In point of fact, the awkward-crank-interacting-with-child business is the most unengaging stuff in the movie. But Kroll’s scenes with both Byrne and Cannavale have both sharpness and sensitivity, especially after Jake discovers some of the rifts in Danny and Justine’s marriage, and also begins to come to terms with his selfish behavior during his mother’s illness. 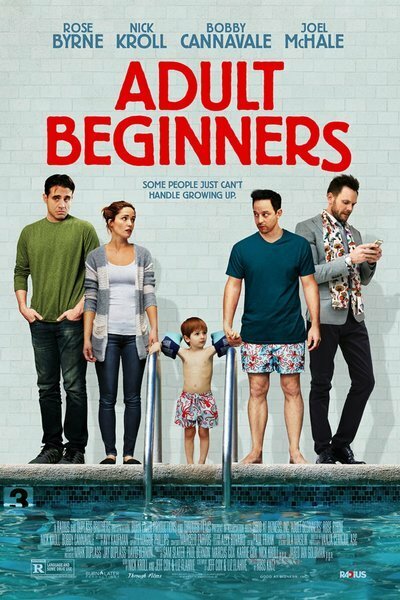 Do they pull enough weight to make a really substantial movie out of “Adult Beginners?” Not quite. The conventions of the contemporary character-driven ethnically monochromatic independent film, including the filling out of the cast with name actors whose contributions are rather transparently circumscribed (for instance, Jane Krakowski as a swimming instructor whose curriculum gives the movie its title, and whose character is only ever seen inside the same swimming pool), while not entirely grating, do keep the movie in a generic slough of sorts. If you’re a big booster of any of the lead actors (I’m something of a Cannavale partisan myself), this will be worth your time.